Written by and starring Tina Fey, the series follows Liz Lemon, the head writer of 'The Girlie Show'. She must learn to juggle her career alongside dealing with an arrogant new boss as well as a crazy new TV star - can she keep it together as well as run a successful TV show? Stars Tina Fey, Jane Krakowski and Alec Baldwin. Emmy Award-winner Tina Fey (Saturday Night Live) writes, executive-produces and stars as writer Liz Lemon in 30 Rock, an Emmy-winning, irreverent, and wildly funny workplace comedy set behind-the-scenes of a live variety show. 30 Rock is told through the comedic voice of Fey and features the inimitable and Oscar-nominated Alec Baldwin as Jack Donaghy, the brash network executive who turns Liz's show (and life) upside down with his meddling ways.Set in New York City, this smart and popular series also stars Tracy Morgan, Jane Krakowski, Scott Adsit, and Jack McBrayer, and boasts a cavalcade of guest appearances from some of the most respected and recognizable faces in comedy. Golden Globe'' and Emmy'' Award winner Tina Fey writes Executive Produces and stars as Liz Lemon the head writer of a live Variety programme in New York City. 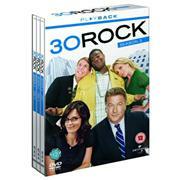 30 Rock also features Golden Globe'' winner Alec Baldwin (as corporate executive Jack Donaghy) Tracy Morgan and Jane Krakowski (as Lemon's unpredictable stars Tracy Jordan and Jenna Maroney) and Jack McBrayer (as the na''ve NBC Page Kenneth Parcell). Co-workers and friends are all trying to balance work and life with the inevitable result of failed relationships disastrous parties at-work drunkenness hard-core coffee addiction world-class sandwich eating and occasional attempts to chop down Christmas trees. Join in the behind-the-scenes hilarity with the complete first and second season on DVD.